I already knew I liked Stu Smith when he told me he had worked for André Tchelistcheff when he was young. By that point in the night we had left the dinner crowd and found a nearby wine bar to talk one-on-one, and Stu had moved on to a glass of beer. I was still sipping wine, but had transitioned from Stu’s Smith-Madrone line up to a cabernet franc from Chinon, which frankly tasted more like an inexpensive, cloying California red blend than the funky fruit from the Old World I was seeking. When you can count Tschelistcheff as a former boss and mentor, you don’t have any legitimate excuses for making bad wine. Thankfully for Stu, he doesn’t need excuses because Smith-Madrone is for real. Stu and his avid followers don’t need me to tell them that, though. André Tchelistcheff could be the subject of an entire book, let alone a blog post, but for now he’ll have to be simply a reference for this blog post. I know about him because of the crucial role he played in the early development of the wine industry in Washington State where I’m from and whose wines takes up half my cellar. He is one of the maybe three most important figures in the state’s wine history. Stu was lucky he didn’t mention the relationship until the end of the night, otherwise we wouldn’t have discussed anything else the entire night. What we did discuss, though, was quite interesting and wide-ranging. Being just a few blocks from Congress we discussed politics, both in the context of general musings and those specific to the wine industry, meaning how local, state and federal decision-making affects the industry (not who is buying you-know-who’s used barrels which may or may not be tainted with brettanomyces (wink wink)). Stu is one of the more politically engaged winemakers I’ve met and when he decides he is willing to go on record about politics, I may have to start a Good Vitis podcast. We also discussed a great deal of Stu’s thoughts about running a winery. For instance, he’s managed to avoid having to start a wine club, which for a winery that celebrated its 45th anniversary last year and makes around 4,000 cases a year is a remarkable feat. Wine clubs are the business model these days for small producers of coveted wine like Smith-Madrone because they bank on future sales to club members. And I say ‘managed to avoid’ because he’d rather not go that route. Why, goes his thinking, do that when you can sell the wine on its merits without having to resort to marketing gimmicks. Even still, he does care about continually expanding his market and building upon his already well-established reputation. That’s the answer, more or less, that I received to my question of why he needed to make the rounds in Washington, DC, let alone sell his wine in the area, given the long-standing high demand for his limited production. It’s an astute answer because it implicitly recognizes that no customer can be counted on for repeat purchases – even wine club members come and go. Over dinner earlier in the night with a number of other Smith-Madrone admirers, Stu began his remarks by stating the belief that ‘you can only make the best wine from the best grapes, and you can only grow the best grapes in the mountains’ because ‘Bacchus loves the hills.’ Stu had the wherewithal in 1972 to plant the vineyards used to make Smith-Madrone’s wines, to this day, on the side of a mountain in the North Coast of Napa Valley, and he chose one with slopes as steep as 30 degrees. Situating each varietal within the vineyard where it was best situated (“eastern exposure for the Riesling, southern and western exposures across flat stretches for the cabernet sauvignon; the coolest north-facing slopes for the chardonnay” according to the website), Stu has moved to dry farming to ensure vine struggle sufficiently to produce smaller berries to achieve a higher, and more desirable, skin-to-pulp ratio (most of the flavors and nearly all of the structure of wine comes from the grapes’ skin). Stu defined his winemaking style as the antithesis to “OTT” (Over The Top). These days, many American consumers like to buy a story, not just a product. Although Stu can deliver his compelling story with thoughtfulness and humor, by the time the competition for his attention bowed out, leaving just me, he was ready to talk about something other than wine. Because I was going to be writing an article about Smith-Madrone we tried to return the topic of conversation to winemaking on several occasions, but we didn’t stay on it for long before going off in the direction of the state of the Republican and Democratic parties, or the regulatory challenges wineries face (especially in land use), or whether winemakers were inclined towards one particular political persuasion, or the value of a good distributor (I can attest to this having heard more than a few horror stories), or if a Parker 89-point review is worse than no review at all (answer: it is), or any of the other dozen topics we discussed. By the end of the night I came to like Smith-Madrone’s story because I liked the man at the center of it. Stu is real people, and you get a deep sense of that in his wine. It’s honest wine for honest people, or at least that’s my slogan for it. I’m quite glad we didn’t dwell on winemaking any longer than we did. 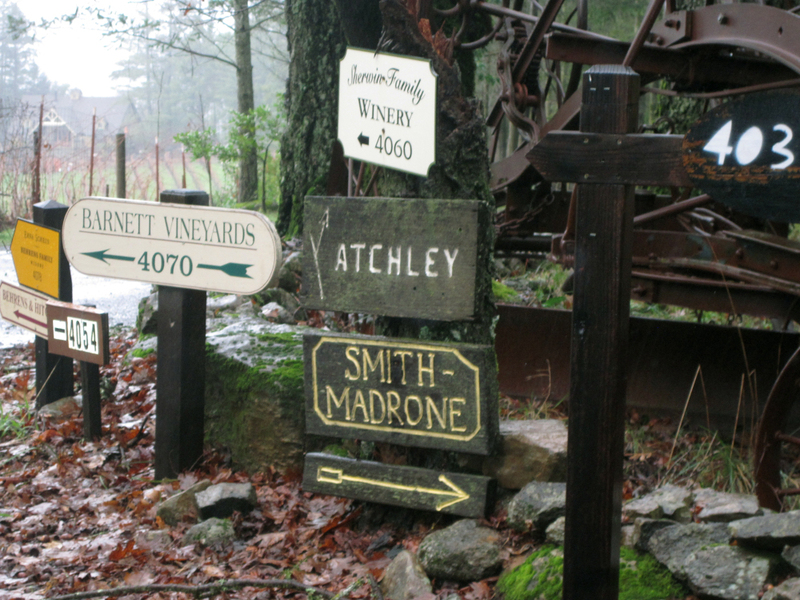 Coming from one of the best areas in Napa for more classically-styled wine, Smith-Madrone’s offerings are fantastic. If you want reserved, classy wines with especially deep and complex layers, all at what amounts to a steal for the quality and pedigree, made by a real person genuinely more invested in the quality of his life’s work than the potential fame or fortune of it, then you need to look into Smith-Madrone. The reviews below are from bottle samples the winery sent me that were tasted sighted.